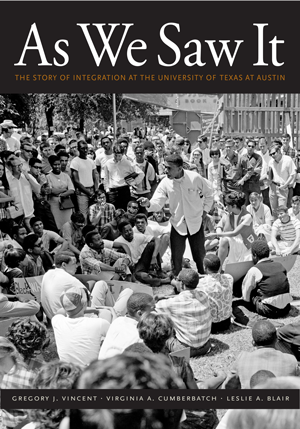 Virginia Cumberbatch, Leslie Blair, and Doyin Oyeniyi discuss the story of integrating the University of Texas at Austin, the ongoing struggle for inclusion and equity on campus, Austin’s chronic problems with racial and economic inequality, and upholding the city’s progressive reputation. Following a Texas Book Festival panel “Making History: The Civil Rights Movement in Texas,” we invited three of the panelists for a longer discussion on diversity and inclusion in Austin—both on and off campus. Virginia Cumberbatch, Director of Community Engagement and Social Equity, and Leslie Blair, Executive Director of Communications, both share their perspectives as staff members at UT Austin’s Division of Diversity and Community Engagement and also as coauthors of the book As We Saw It: The Story of Integration at the University of Texas at Austin. Also contributing to our discussion is UT Austin alumnus and Texas Monthly reporter Doyin Oyeniyi, who co-created the web series Austin While Black, a project that documents the stories of Black Austinites. In the first half of our conversation, we cover some of the remarkable stories from As We Saw It, including the legacy of women in the civil rights movement at the university and the integration of UT Austin’s athletics program. In the second half of our conversation, we address the university’s ongoing efforts to foster inclusion and combat bias, including the recent removal of confederate statues. Our guests also evaluate Austin’s reputation as a progressive city and discuss how both institutions and individuals can work toward dismantling institutional racism.